London's Mayor has called for more immigration from the Commonwealth. One could be excused for detecting a certain Jekyll and Hyde quality to Boris Johnson’s pronouncements on immigration. On the one hand, the London Mayor wrote the foreword to a report published today by the Commonwealth Exchange saying that ‘we should welcome the brightest and the best from a wider range of countries’, and last week described himself on Question Time as the only politician ‘actually willing to stand up and say he’s pro-immigration’. And yet, on the other hand, Johnson wrote an article in the Telegraph a few weeks earlier calling for the Tories to tighten border controls to prevent the UK being the ‘America of the EU; the place people want to come; the magnet for the hordes at Calais’. The reason for the superficial discrepancy is, of course, those two innocuous letters in the last sentence, E and U. Johnson is certainly pro-immigration in general, writing in the Telegraph that ‘it would be madness to close our borders to talent’. It would be madness, too, for the mayor of a city whose population is one quarter foreign-born and whose businesses depend on foreign trade, talent, tourism and investment, to go all little England on us, which probably explains his vigour on the subject. So why has Johnson got a downer on Europeans? 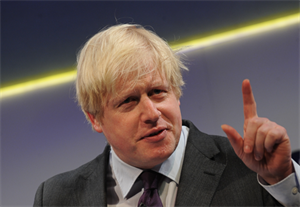 Four more letters: U, K, I and P. While Johnson would clearly prefer not to offend the hundreds of thousands of EU citizens living and working in London, he is acutely aware of the threat to the Conservatives from UKIP voters, whom he nicknames ‘kippers’. These kippers, he believes, are primarily motivated by frustration about the EU’s freedom of movement, and would return to their natural political waters once Britain either exited or renegotiated its position in the EU. And, of course, if a certain fair-mopped Mayor were indeed to return to Parliament and run at some point for Tory leader, it wouldn't hurt to have appeased the party faithful. Would the Commonwealth provide a talent pool for British businesses as deep as the EU’s? Johnson seems to think so, pointing to the much larger and younger population of the ex-Empire, and decrying the fact that migration from the old dominions of Canada, Australia, New Zealand and South Africa declined by 50% between 2001 and 2011. But that decline doesn’t necessarily have to be the result of strict British immigration policies. Perhaps Kiwis, for instance, just don’t want to come to the UK as much as they used to. We probably won’t be able to tell what would happen without actually implementing freer movement within the 2.4 billion strong Commonwealth. It’s hard to see how that would be anything other than out of the frying pan and into the fire for all those kippers.